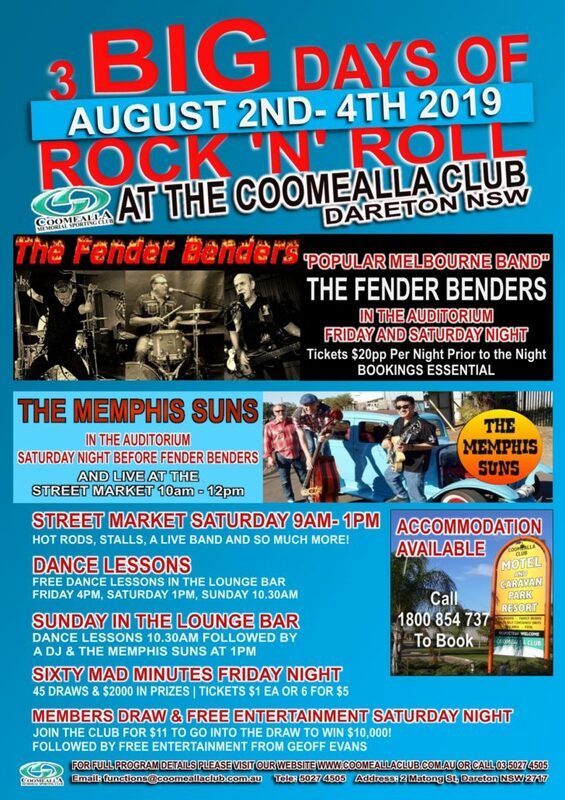 Coomealla Memorial Sporting Club is holding their very first Rock & Roll Festival from Friday 2nd August- Sunday 4th August 2019. Bookings required for all shows in the Auditorium. $20 Per Person per night prior to the night. $25 Per Person per night on the night. Interested Street Market Stall Holder? Please contact our Functions Coordinator Natalie Wescombe to register your interest in being a stall holder at our Street Market. Limited spaces available. Contact 03 5027 4505 or email functions@coomeallaclub.com.au for more details.